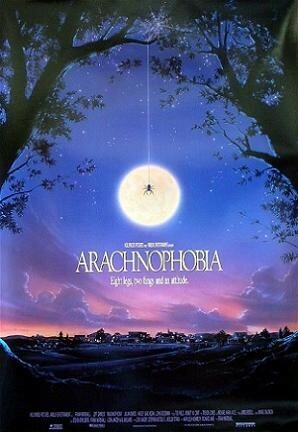 Arachnophobia falls firmly in to the category of ‘Family Horror Movie’. It’s a good story, well told with a few enjoyable jumpy-scares along the way and you could happily pop some popcorn and watch it with your (non-scardey cat!) kids. The gross out factor of this film is heavily weighted by how you feel about the titular monsters. If you dig our eight-legged friends, then you may find this an enjoyable romp. If you are not such a big fan of spiders, you may find that the hairs on the back of your neck stand up as as you watch this movie. But we’re not here to talk about the spiders in Arachnophobia. Oh no. We are here to talk about the scene stealing star of the show, Delbert McClintock. A smack-talking, spider-stomping badass. Terror Factor – Delbert is a pretty easy going dude, though he wields a mean bug sprayer. Overall the terror factor is minimal. Costumability – Like Samhain, Delbert is a pretty practical costume. Bugs-B-Gone hat, thick glasses, pocket protector, blue/green short sleeve shirt and matching pants and you’re good to go. If time permits, you can build a pretty awesome bug spray back pack out of some 2 litre soda bottles and whatever gauges and tubing is laying around in your garage. Bonus points if you can pay a neighbourhood kid to follow you around and play Delbert’s theme song on a harmonica. Icon Factor – Delbert is totally under appreciated. Dress up as him this Halloween and make him the icon he deserves to be. Anyone who doesn’t think this is a horror film obviously doesn’t understand the true evil nature of spiders!! 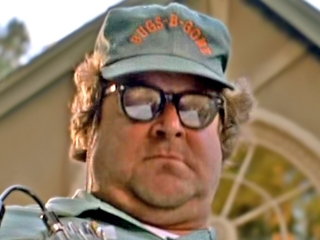 This entry was posted on October 28, 2014 by coochiecrunch in Coochie Crunch Blog and tagged Arachnophobia, Halloween, Horror Icons, John Goodman.